In 2009, the American author / journalist, David Grann, wrote and published a book which documented the travels Percy Fawcett made through the Bolivian Amazon. The name of this book is called 'The Lost City of Z', and last year it was made into a feature length film that starred Charlie Hunnam, Robert Pattinson, Sienna Miller, and Tom Holland. This year it's also been released on Blu-ray, DVD, and digital download (July the 24th, 2017), which quite frankly gives me a good excuse to compile a list of films based around the theme of exploring new places and discovering new things. Here, check this out if you have the spirit of adventure running inside you. After all, what have you got to loose? An ark? A martian? Or how about a gigantic dinosaur with sharp pointy teeth? Please enjoy. Do I have to write anything here? Seriously? Do I? If so, then please allow me to introduce you to the Steven Spielberg classic which features a great cast of characters that you can't get enough of! Meet Indiana Jones, mild mannered university lecturer by day, and swashbuckling adventurer by night. Recently a group of Nazis have stolen a precious artifact he wanted to salvage from Peru, so of course, Indy being the type of person that he is, he runs off to do battle with whoever stands in his way. Now on a quick side note, you might like to know that the character of Indiana Jones was inspired by none other than Percy Fawcett himself. Percy’s passion for cultural artifacts and history gave George Lucas the imagination to come up with this brand of daring adventurer. That, plus the name of his dog! Have you noticed that a lot of explorers have become quite bored moping about our blue and green planet? In fact, they've become so bored by this, they've even traveled to space to see what the hell is going on out there. Take Matt Damon's character in The Martian for instance. He and a group of fellow space boffs go on a mission to Mars and one of them ends up staying there for a very long time. Not deliberately, of course, because during their departure they fail to acknowledge that they’ve left something behind. Or should that be, someone behind? Namely, Damon's character, who gets stranded on this red planet and is forced to survive in any which way he can! Fingers crossed, he'll get lucky in the end. Jurassic Park is a film which basically takes the concept of a theme park and injects it with a double dose of crack. The overall story involves a group of egg-heads who manage to clone many breeds of prehistoric animal and then allows them to roam around a desolate island off the coast of Costa Rica. While there, guests are allowed to visit these creatures with the hope they can learn and get some enjoyment out of the experience. Here's hoping nothing goes wrong, eh? I mean, if something did happen, could you imagine a dinosaur baring down on a poor innocent individual and eating the fuuuuu.... AHHHHHHHHHHHH!!!! Perhaps one of the earliest examples of a true explorer comes in the form of men wearing eye patches, sporting peg legs, while boasting sarcastic colorful birds perched upon their shoulders. You know, just like Captain Jack Sparrow, star of the Pirates of the Caribbean films, who along with his misshapen crew of drunken misfits sail the high-seas on a quest to find the last golden coin which will grant him sweet, sweet, mortality. Eventually Jack shows that he is a true master of exploration, as he builds a huge secret stash of booze on a desert island just in case he gets stranded there, which he does, in the long run, not that this bothers him very much, Burp!!! The second example of space exploration on this list comes in the form of Stanley Kubrick’s mind-bending sci-fi symphony, 2001: A Space Odyssey. In the space of two and a half hours, Stanley was able to explore where we’ve come from, where we currently are (circa 1960), and where we'll be going next. He does this through the use of an ominous looking black monolith, statuesque in form, and not really seeming to do anything in particular. That is anything except to observe us from our primordial state all the way up to the otherworldly beings we are supposed to become. After exploring outer space with Aliens, James Cameron turned his attentions to what has become a personal passion project of his, that being deep-sea exploration. This film depicts a crew of an experimental, high-tech submersible, which gets called into action to investigate a mysterious nuclear submarine crash at the bottom of the sea. A series of strange encounters then leads each member to suspect that the accident was caused by an extraterrestrial spacecraft, housing alien species, and in order to make contact with them, they must brave... the abyss. 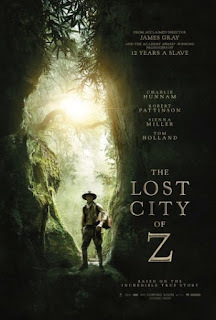 The Lost City Of Z is available on Blu-ray, DVD, and digital download from the 24th of July, 2017.